Our "trip" started in 1987 in Torre dei Nolfi, a little town near Sulmona. 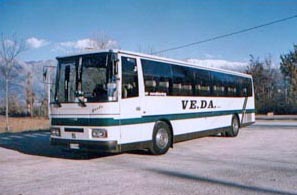 At the beginning, we used only one coach, but thanks to quality and efficiency, now we have at our disposal a modern and well stocked fleet of cars..
We have coaches for national and international long-distance touring and also coaches for congresses, ceremonies, oathes, transfers to and from airport, always with driver. We have at our disposal a modern machine shop, so our fleet of cars is always safe, reliable and comfortable.